Moths aren’t the only things attracted to lights at night, and I tend to get a lot of non-lepidopteran insects in the trap, though moths make up the majority of the catch. The other night I found half a dozen of these guys on the egg trays. I’ve seen them, or things like them, before, but most of the time I’m preoccupied with the moths and don’t bother with photos of most of the rest of the stuff (once I’m proficient with moth ID, then I’ll start worrying about the other stuff in the trap). There weren’t too many moths in the trap this week, though, so I could take a few moments to check out these critters. They were quite small, perhaps only 5 mm (<1/4″). The most noticeable thing about it was the fuzzy bit poofing out from its back end, under its wings. It looked like a bit of blue cotton batten that had gotten stuck to its abdomen. Its body was a lovely shade of indigo gray. It had long wings that projected some length beyond the end of its body. At first glance it looks a bit like a fly. The proportions of the wings give it away as an adult aphid, though; flies’ wings are never that long. Specifically, it’s a woolly aphid, perhaps Woolly Alder Aphid, Paraprociphilus tessellatus. They have two forms, a wingless and a winged adult, both of which are covered in fuzzy hair-like projections that give them their name. Individuals of the wingless form cluster together in a mass on the branch or twigs of their host trees, looking a bit like a fungus gone wild. I’ve never seen a group of woolly aphids like this, and their weirdness had sort of placed them in that group of “organisms that other people see”. 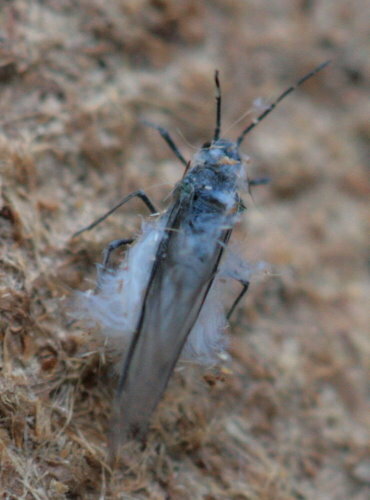 So I was surprised when I looked this one up, and submitted it to BugGuide.net for ID, to discover that it was a woolly aphid adult. It makes sense, though, with a woolly abdomen like that. In both forms of adults, the “wool” is not actually hair at all, but wax it secretes into long projections. There are a number of species of woolly aphid, of varying colour, though they seem mostly to be pale. The fuzz is thought to serve a couple of functions. First, it acts as both camouflage and defense against predators. Second, it may have thermo-insulative properties, both protecting against sun in summer and against cold in cooler months. In the case of the Woolly Alder Aphid, they overwinter as eggs in crevices in the bark of maple trees, although one website suggests the woolly clusters might also be able to survive the winter tucked out of sight somewhere. The individuals that hatch out in the spring are all females. They find themselves a new maple leaf and attach themselves to the midvein, where they slurp nutrients from the sap. These females reproduce parthenogenically; that is, without the aid of males. The live young they produce are also females, essentially clones of their mother. Around mid-summer, something in the way they produce their offspring changes, and the now-sizable colony begins producing winged females. These winged adults fly away from the maple tree in search of an alder, where they spend the rest of their summer, once again reproducing asexually, without males. Just before winter, the colony again begins producing winged adults, but this time of both sexes. The males and females get together on maple trees where they mate and the female lays eggs that begin the new generation the following spring. It would be these pre-winter adults that I attracted to my trap. I don’t know if you can tell apart males and females. Aphids can produce up to 12 generations in a single season. Apparently, if every individual descending from a single overwintered female survived for the entire summer, by the end of the year her progeny would weigh the equivalent of 600 million people. Good thing they don’t live all that long. When the winged adults are produced, just before they take off for their next destination they cluster on the leaf or twig with their parent colony. If disturbed while doing this, they will take to the air, looking a bit like you just brushed a dry dandelion head and sent all the seeds drifting off. 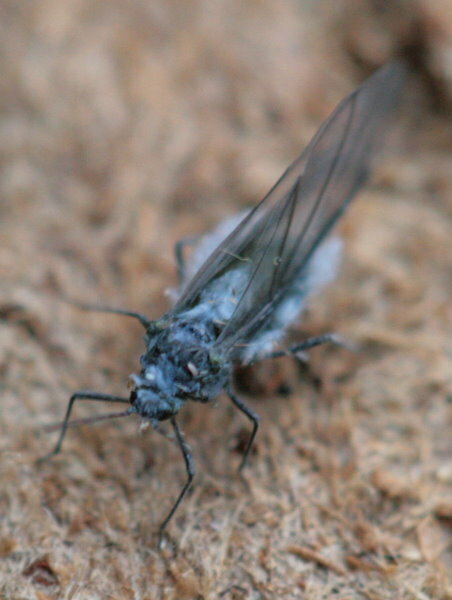 Their appearance as drifting bits of fluff while on the wing has lead to the colloquial name of “fairy flies”. I’ve seen these — or their relative — but knew nothing about them beyond the fact they were woolly aphids. Thank you for the informative post. That’s my situation, too, with a lot of things out there, Marvin. Part of the reason I initially started the blog was as encouragement for me to investigate a bit more into all these neat things I was seeing. I’ve discovered some fascinating things along the way. I have several indoor cacti. I also live on the top floor of a building which has a roof infested with aphids. Every summer the landlord has to hire a pest control compay to get rid of millions of these little pests. My question is will these wooly aphids enter an apartment when it gets cold outside and how do I get rid of them? Ttey’re driving my cat nuts and now they are in my hair.